ChessMaine: 2017 U.S. Women's Champion WGM Sabina Foisor is Coming to Maine! 2017 U.S. Women's Champion WGM Sabina Foisor is Coming to Maine! 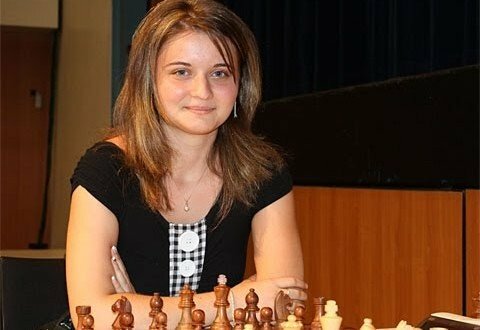 01.27.19 The 2017 U.S. Women's Chess Champion WGM Sabina Foisor is coming to Maine this weekend! We are thrilled and honored to welcome this very accomplished international player to the Pine Tree State. Sabina will give a 40-board simultaneous chess exhibition at 4:30 p.m. on Friday, February 1st at John Bapst Memorial High School in Bangor. Hurry! At this writing there are still five seats remaining at the simul. Take advantage of this great opportunity to play a U.S. Champion! Here are more details of WGM Foisor's visit which, in addition to the simul, include an exclusive lecture for participants in the Maine Girls' and Women's Championships, and game analysis during the tournament. The Maine Chess Association is delighted to welcome 2017 U.S. Women's Chess Champion WGM Sabina Foisor to Maine on Friday and Saturday, February 1-2, 2019. WGM Foisor has a Bachelor of Arts in Modern Language, Linguistics and Intercultural Communication and a Masters of Arts in Intercultural Communications (INCC) from University of Maryland, Baltimore County. She is married to GM Elshan Moradiabadi and both live in Durham, North Carolina. Check out Sabina's lecture at the St. Louis Chess Club: The Art of Zugzwang | Endgame Exclam!! Bapst Memorial High School, 100 Broadway, Bangor, Maine. donations welcome but not required.